A compact design and straightforward functions make the B412dn easy to use and small enough to fit on a desktop or locate in any corner of the office. 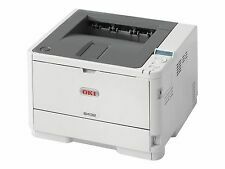 OKI B412DN Mono Laser Printer 45858301. A duplex print option, energy-saving features and an optional high-capacity toner all contribute to lower running costs. Automatic Duplex Printing (2-sided). USB 2.0 connection. We will always go out of our way to source the product you are looking for. Automatic Duplex Printing (2-sided). Print up to 40ppm (Mono). USB and Ethernet connections. We will always go out of our way to source the product you are looking for. OKI Microline ML-5520. 1 x OKI Microline ML-5520. A4 9 Pin Dot Matrix Printer. Parallel, Serial and USB Connections. 1 x Ink Ribbon. 1 x Power Cable. Warranty ; 6 Months RTB Warranty. USB & Parallel connections. Print up to 19ppm (Mono). Add to Favourites. We will always go out of our way to source the product you are looking for. Print on 6 multipart forms (5 copies original). Print up to 570 Characters per second. We will always go out of our way to source the product you are looking for. Parallel and USB interfaces. Print up to 35ppm (Mono). Automatic duplex printing (2-sided). USB & Ethernet connections. We will always go out of our way to source the product you are looking for. 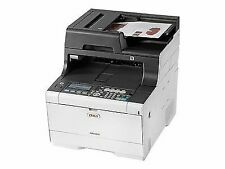 OKI MC563DN A4 Colour Multifunction Laser Printer 46552701. 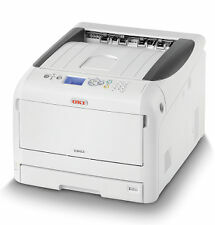 The OKI MC563dn printer is a printer perfect for any situation. 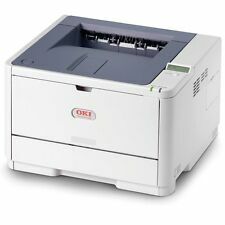 OKI MC563DN A4 Colour Multifunction Laser Printer. Manufacturer Code: 46552701. Part : 45858403. 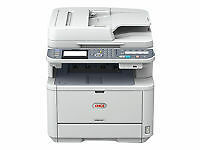 OKI M562dnw A4 Mono Multifunction Laser Printer. Supplied with 12 month OKI Warranty. The Printer Broker Ltd is a supplier of printers, fusers and printer parts based in Bolton, Greater Manchester, UK. PRINTER ONLY NO FEED TRAY CABLES OR SOFTWARE. All units are 2nd userunless stated otherwise. Most units are from office upgrades. For example this maybe requiredfor future updates for Microsoft products and any other software. USB and Parallel connections. 9-Pin Print head. Print up to 375cpm. Print up to 4 multi-part forms (Original 3 copies). We will always go out of our way to source the product you are looking for. Add to Favourites. The MC563dn is easy to set-up and use with a range of eco-friendly features that save energy and help to lower running costs, including duplex printing as standard. Print Speed- A4 30 ppm colour, 30 ppm mono. Print up to 20ppm Mono and Colour (A3). Print up to A3 Size. Print up to 35ppm Mono and Colour (A4). USB & Ethernet connections. We will always go out of our way to source the product you are looking for. 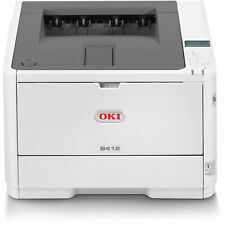 Oki B412dn A4 Mono LED Printer - BRAND NEW! A4 Mono Laser Printer. The box might not be the original and(or) New condition and will have tape or label marks due to tape removal and storage. If you are not happy with the item you received. Clearance products may either be New, Used and(or) Incomplete. 4.5 out of 5 stars - Oki B412dn A4 Mono LED Printer - BRAND NEW! 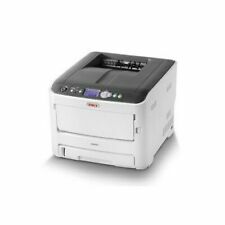 2 product ratings2 product ratings - Oki B412dn A4 Mono LED Printer - BRAND NEW! Automatic Duplex Printing (2-sided). We will always go out of our way to source the product you are looking for. Print up to 32/20 Pages Per Minute (Mono/Colour). Add to Favourites. Automatic Duplex Printing (2-sided). USB, Parallel, Serial & Ethernet connections. Print up to 45ppm (Mono). Network printing. Add to Favourites. We will always go out of our way to source the product you are looking for. Automatic Duplex Printing (2-sided). Print up to 40ppm (Mono). USB 2.0 & Ethernet connections. Print, Copy, Scan & Fax Functions. We will always go out of our way to source the product you are looking for. Print up to 20ppm (Mono). Print, Copy, Scan & Fax functions. USB connection. Print up to 600 x 600dpi. We will always go out of our way to source the product you are looking for. Add to Favourites. Part : 01308701 / 42114033. 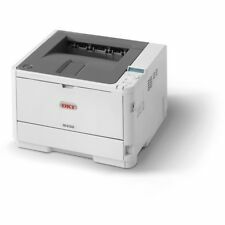 O ki Microline ML5521 eco Elite A4 Mono Dot Matrix Printer. The Printer Broker Ltd is a supplier of printers, fusers and printer parts based in Bolton, Greater Manchester, UK. B432dn_If you need a black & white printer that supports the highest levels of office productivity, without straining your budget, you need the B432dn. You get real peace of mind with a B432dn. High performance A4 mono printing for the more demanding user. Print up to 16ppm (Colour). USB 2.0 & Ethernet connections. Print up to 22ppm (Mono). 1200 x 600 print resolution. We will always go out of our way to source the product you are looking for. Add to Favourites. Automatic Duplex Printing (2-sided). USB and Ethernet connections. Print up to 33ppm. Print, Copy, Scan & Fax functions. We will always go out of our way to source the product you are looking for. O ki Microline ML3391 eco Mono Dot Matrix Printer. Part : 01308501 / 42089523. The Printer Broker Ltd is a supplier of printers, fusers and printer parts based in Bolton, Greater Manchester, UK. But with OKI, there’s no need to compromise between price and performance. Affordable, professional, A4 mono printing. Laser Printers. Maximum resolution: 1200 x 1200 DPI. Print resolution (colour, normal quality): 1200 x 1200 DPI.